DataPoint: How Much Do Consumers Spend on In-App Purchases? The freemium model is the most-popular way for developers to monetize their apps. But how much money do consumers spend on an in-app purchase? By some measures, freemium is the most-profitable strategy for mobile apps. Revenue from this model is on the rise, and it’s the strategy of choice for developers like Supercell and King. But how much do consumers actually spend on in-app purchases? According to AppData, it varies greatly from app to app. Clash of Clans, the biggest revenue generator on iOS, boasts an average in-app purchase of $36.99. By contrast, the average in-app purchase for Candy Crush Saga is $1.49. 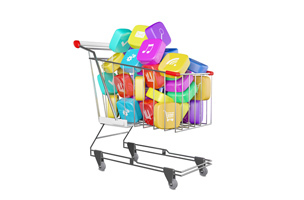 How much do you typically spend on an in-app purchase?